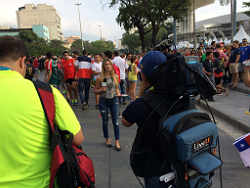 FIFA World Cup Brazil: broadcasters use LiveU for live transmissions. Hackensack, NJ, June 2014 – LiveU (www.liveu.tv), the leader in portable live video acquisition, contribution and management solutions, has announced that more than 80 broadcasters from around the world have already used its technology during the first week of the 20th FIFA World Cup in Brazil, bringing the event to life and providing 360 degree coverage that would otherwise be impossible. Broadcasters are choosing to transmit the vast majority of their LiveU footage live: a remarkable 98 per cent of the 3945 transmission sessions that have occurred at the time of writing were made using live transmission mode. This represents a major increase from the last game-changing event for cellular bonding: the London 2012 Olympics. With over 200 LiveU units deployed, 816 hours of live transmission, and over 22TB of data delivered in the first week alone, the tournament is proving highly successful for those using LiveU. Juan Pablo Marino Director of transmission Caracol TV Columbia said: "We used several solutions from LiveU for the World Cup. The mobility we had with the units and Xtender gave us the ability to go live from five different locations at the same time following the Colombian team and its fans. A true game changer for us in the creation of content for global events." With LiveU, broadcasters no longer need to rent expensive satellite trucks, have the ability to easily travel with their LiveU backpacks throughout the 12 host cities which are located far apart, and provide live shots from anywhere without line-of-sight or vehicle access limitations. Therefore, broadcasters can now provide up-to-the-minute content, from many more places, and in a cost-effective manner. By leveraging the new 4G networks that were deployed in Brazil ahead of the World Cup, LiveU units are providing satellite-like picture quality with low end-to-end delay. During the FIFA World Cup 2014™, LiveU is providing onsite support at all the main venues in Brazil both directly and through its local partner, UCAN Digital Transmission. LiveU is deploying its entire portfolio of uplink solutions, including its backpack and camera-mount cellular bonding devices such as the LU500 and its signal boost Xtender external antennas. LiveU’s support team is on the ground in the different venues, offering onsite 24/7 support in multiple languages during the tournament.